Leda of course was the mother of Helen of Troy, but I have no evidence that the falls, near St. Helens, were named for this reason. Leda falls are known to have existed. They are referenced in the Picturesque Atlas 1886 - Descriptive Sketch of Tasmania Page 104. "Seven miles from St. Helen’s are the Leda Falls, formed by a stream leaping over a huge shelf of granite into a deep gorge overhung by gloomy masses of rock, of the same geological formation, tapestried by innumerable varieties of ferns and creeping plants, and crested by eucalyptus, acacia, and dog-wood trees, intermingled with moisture-loving shrubs". They were on leasehold land at one stage held by Mr. Samuel.H. Wintle of Hobart. Among other things, Wintle was a prospector who went looking for tin the area around Georges Bay (St. Helens). Wintle writes, "These falls are situated on my leasehold, Saxleby, (his spelling in correspondence) Eastwood, seven miles from George's Bay, and in the centre of the tin-mining district." As an aside, Samuel Wintle was a nephew of Henry Melville (aka Henry Saxelby Melville Wintle, aka 'Henricus'). 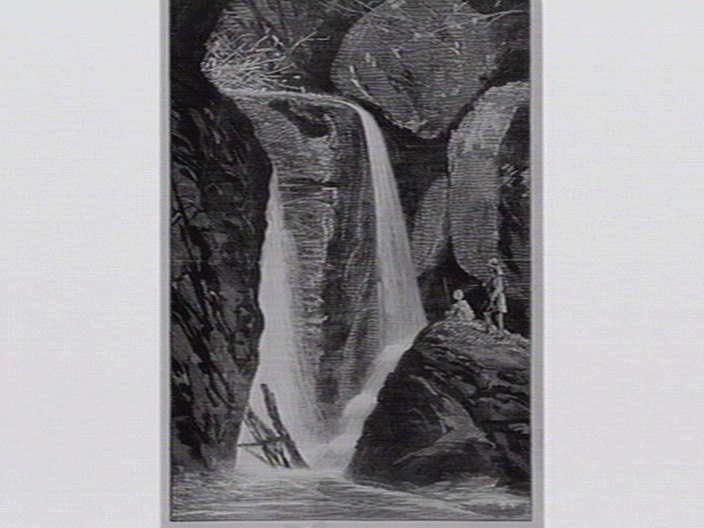 The best evidence of what the falls looked like was submitted by Wintle himself, as a wooden engraving of the falls, along with a description and a poem about the falls, to publishers Alfred May and Alfred Martin Ebsworth. The engraving was included in a the International Exhibition Melbourne 1880-81. An article about the exhibition appeared in the The Australasian Sketcher with Pen and Pencil, Saturday 20 November 1880, page 307. It is even possible that all other references are based on this one exhibition and the resulting publicity. The wooden engraving is held in the "State Library of Victoria". You can see details at Victorian State Library. Now stealing, dream-like, through deep, sunless shades. Where never ripple ruffled its cool breast. Where noise, and mist, and wild confusion reign. "A stream, which takes its rise in the high granite hills of the district, after flowing through button-grass, marshes and dense thickets of bauera, cutting-grass, and ti-tree, suddenly plunges down a deep and most romantic rocky gorge. Here it is broken into numerous miniature falls, now eddying round the walls of a granite basin which it has carved out through untold ages, and anon bubbling among the moss-covered stones; which interrupt its course, till, when half-way through the gorge, it drops over a deep vertical precipice with, deafening roar when the stream is swollen. At the verge of the precipice the stream is intercepted by a projection of rock, which causes it to diverge and fall in two streams into a deep depression of the granite, which is choked with flood- wood wedged in the crevices of the rocks. At the top of the cliff is a large hole which the water has scooped out of the adamantine rock in bygone times, when the spot presented a different configuration to what it does now. At the side of the ravine huge overhanging masses of water-worn and weathered granite, some of them thousands of tons in weight, give rise to numerous recesses of Cimmerian gloom. Over their portals hang festoons of climbing plants and delicate fronded ferns. From the joints and, crevices of the granite walls grow in profusion gum-trees, acacia, dogwood, and others, whose branches, meeting overhead, form a canopy which in parts excludes the noontide sunshine. In the centre of the cliff, between the falls will be seen a striking resemblance to a human face. Nothing that exactly fits the description of Leda falls is still known in the St. Helens area. However, the fact that it was in the "...centre of the tin-mining district" and on a mining leasehold may well explain the fate of the falls. In the Papers and Proceedings and Report, of the Royal Society of Tasmania, for 1881 there is a submission from Mr. S. H. Wintle that includes specimens of "Sandstone and Slate in contact with Granite, from George's Bay". Wintle's submission includes the following remark, "...The missing link in the geological chain was supplied about six months ago, through blasting operations being carried on in the creek of the Saxelby tin claim, seven miles from George's Bay." Perhaps the falls were destroyed and the tin extracted. Perhaps the falls were altered and are no-longer recognisable. Perhaps the stream was diverted for mining and the falls no longer flow. Perhaps, hidden away somewhere in quiet gully, is a long lost waterfall. If you can help add to or improve this page, please consider joining in the discussion on the forums. This page was last modified on 7 April 2013, at 10:49.